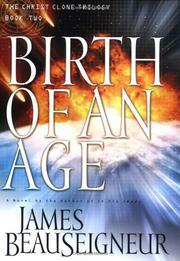 Christological SF from an author (In His Image, 2003) who thinks really big. The trilogy was self-published in the 1990s and, we’re told, sold 10,000 copies before Warner bought it. It’s the science pages that catch you up, although the Christology is damnably inventive (an exact description). Chief villain of installment two, set in 2019, is revealed to be Yahweh himself. In the story thus far, live cells from Christ’s body have been found in the Shroud of Turin, and a twin Christ has been cloned by Harold Goodman, who raises the Christ twin as his own son, Christopher Goodman. Nuclear war breaks out between India and rogue Pakistani forces, with China and Russia stepping in, and now Russia is no more, while a strange plague kills a quarter of mankind. Christopher fasts for 40 days in Israel’s wilderness and, returning, tells his companions, Decker Hawthorne, a journalist (who turns out to be Judas), and Robert Milner, former bigwig of the UN, that God wants Christopher to fulfill his mission begun 2,000 years ago. Meanwhile, nuclear war has killed or radiated 420 million. That’s a lot. But far worse is coming. As the Italian Ambassador to the UN, Christopher hopes to become secretary-general and lead mankind to a New Age. But two psychics arise in Israel, saying they are the Apostle John of the Christian New Testament and John the Baptist, and they preach woe. Indeed, they attract three meteorites to Earth, whose impact is dizzyingly well-described, wiping out the entire Middle East but not one Israeli, followed by a plague of giant bloodsucking locusts, then a madness of phantoms on ectoplasmic horses spreading death everywhere. Assassinated in the UN, Christopher rises from the dead after three days and reveals that he’s actually an ally of Lucifer, the good angel, while Yahweh is a sadist to be despised. Astoundingly intelligent. Next volume: Acts of God, set for January 2004.